The In Guardia parade is a popular spectacle with tourists who visit our island. 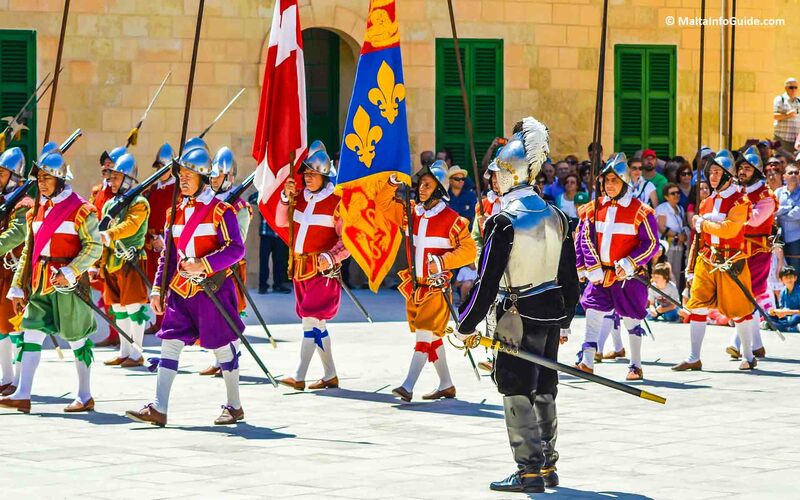 It is the opportunity to go back in time to an event which was held frequently by the Knights of St. John in all major forts in Malta. An interesting and entertaining event where you will see different performances of drills, fencing, fire arms and canon firing by the bombardiers. It is important to note that presently the In Guardia Parade are not being held. The new schedule will be announced later during this year. It takes place at Fort St. Elmo the most prominent fort of the island. Due to its location it guards two harbours the Grand Harbour and Marsamxett Harbour. The fleet of the order used to be anchored at the Grand Harbour where they also had the docks and several other storage facilities to store ammunition and food for themselves and the population. The re-enactment goes back to the time of glory when the Knights of St. John had an enormous responsibility of guarding the ports. Their glory became more famous after the Great Siege of Malta in 1565 when the Turkish fleet did not succeed to take over Malta. Most of Europe had a very high esteem of the knights as being able to hold the Turkish army from advancing further up to Sicily and Europe. It was of utmost importance that this fort was always ready to resist any attach that could come from the sea. This re-enactment depicts an actual event that used to be an ongoing procedure inside Malta’s major fortresses with the regular inspections by the Grand Bailiff who was in charge of the military affairs of the Knights of St. John. More than 50 actors dressed as soldiers and with them the knights stationed at the fort dressed with their typical historical uniform of the time take part. They show their abilities in military exercises and drills. They have to convince the Grand Bailiff that they are at their best in their military stamina to defend Fort St. Elmo at any time with alertness. The captain of the fort, knowing of the Grand Baileff visit prepares his men in arms and gives them the required instructions. The Grand Baileff is greeted with a military salute followed with various military drills performed by all ranks within the fort. He inspects the troops and then a short ceremony giving respect to all the representative flats of the Langues (Nations) within the Knights of St. John. Entrance & Ticket Booth: Across the road beside the Mediterranean Conference Centre from where The Malta Experience audio visual show is screened. It is important to note that presently the In Guardia Parade is not being held. In case of bad weather the In Guardia Parade can be cancelled without any notice. You will have to phone the Tourist Information Centre in Valletta.